As mentioned in a previous post, I started working on a bucket list item, Viajante by Martina Behm. Of course I made some modifications. Change the center double decrease from ever other row to every THIRD row. This will widened the shawl slightly faster. Less choking feeling when worn as a cowl. Double double center increase (4 new stitches). And then a rest row. I did the double double center increase this way. But it was a bit too puckered. And I was too lazy to block it out. So I changed the make 1 to another YO. 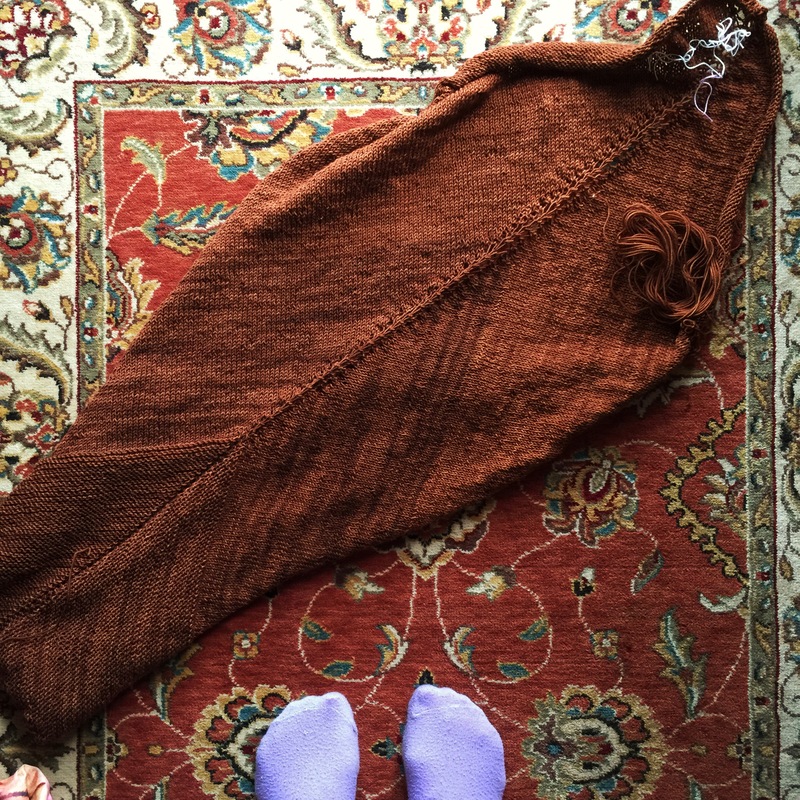 It has been a wonderful knit anywhere project. But as the thing grows that might change to only night time and road trip knitting. Oh, that means I should get some socks or hat on needles as purse knitting. I am about to finish skein two, 860 yards done. Half way through the shawl-cowl. I will probably go back to the double center decrease every other row now. I have not counted stitches. To be honest I don’t want to know how many stitches are on the needles. I do track how many rows I finish every night. The number of rows I can finish each night is slowing down to about 5. Since this is mostly stockinette I am trying to practice knitting without looking at it. I saw Laura, of the Knitgirllls podcast, working on socks this way. Fortunately, my problem is not dropping stitches doing this. 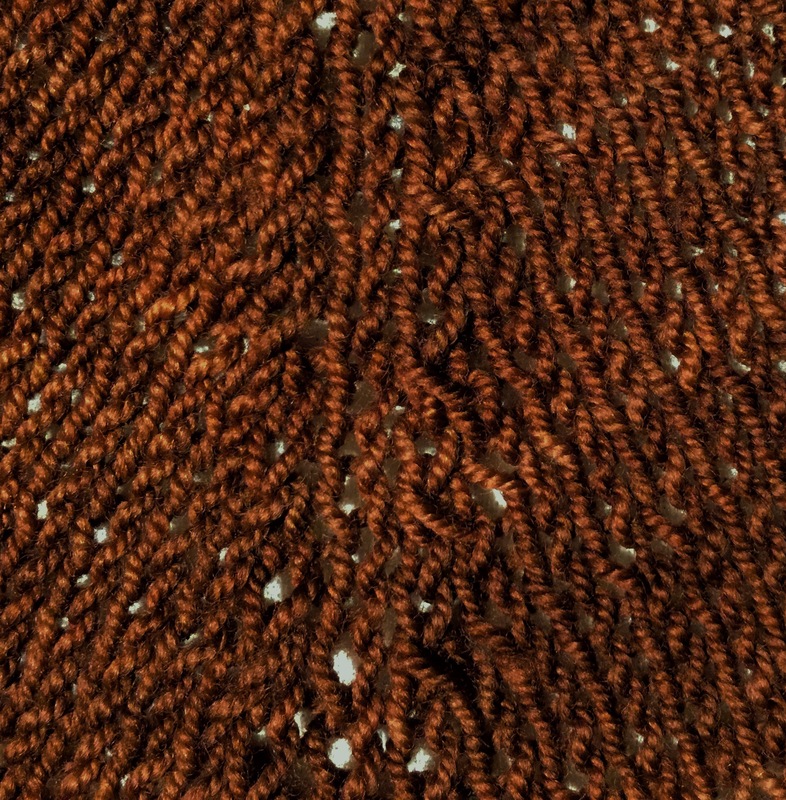 What I do is slip stitches once in a while. So this does require serious admiring, or inspecting, of the work. Handwinding third skein yarn is satisfying. 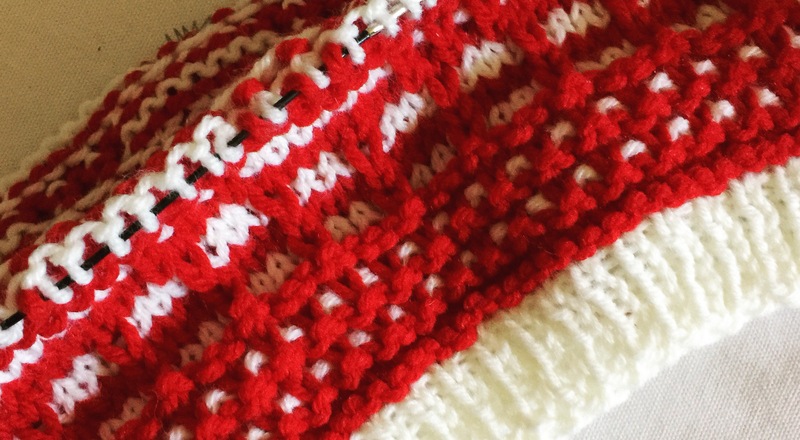 This entry was posted in Zigzagging on August 24, 2015 by slantedstitches. We love pho, the Vietnamese noodle soup with fresh mint, cilantro and basil. Double yum on a cold rainy day. But we also live in the South, where there are few Vietnamese to support a good pho restaurant. And it’s 90 degree with 60-80% humidity for 3-4 months of the year. Fortunately, Memphis has several large international grocery stores where we can find all kinds of different cuisines. So of course Mom wants to go explore. I think she might overdo it. Since we don’t know products like which noodles to get, we get several. We bought five on this trip. On the drive back to Nashville, we settle on making chicken pho. I made beef pho years ago and remember it was a 2-3 day process. I did not want to do that again. I hoped and assumed chicken would take less time. Little did we know how hard it was to find the rest of the ingredients. 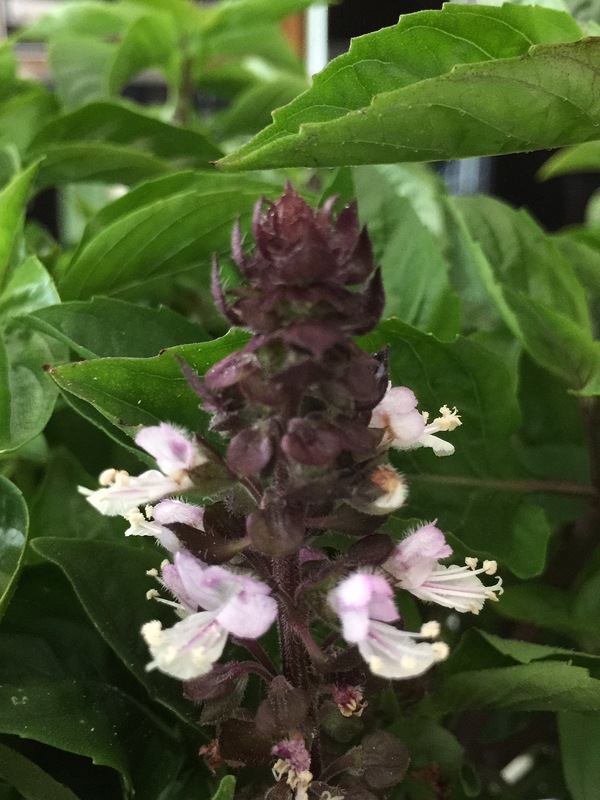 Lucky the Mennoite farmers market vendor had a beautiful bundle of fresh Thai basil. Wow, it makes the kitchen smell so good. Cilantro is a critical ingredient in the broth. Why, oh, why did we have a craving for pho during a national recall for cilantro? Found it by the end of the week. No luck finding chicken backs at the farmers market (it was on the price list, but she didn’t bring any. Besides it was $3/pound.) Nor 3 grocery stores. What do they do with the bone? So we substituted legs for the back bones. We have now spent $15 just in chicken. Remember there are only two of us. Yeah…. Ok, read through the recipe 2-3 times and get started. 3 hours later the broth is simmering. But it’s weak. So I let it simmer until dinner time. Dinner was very yummy. Consumed too quickly of a photo op. But there’s enough chicken and noodles to feed an army. Noodles are in the freezer as is the rest of the broth (disappointedly only 2 quart containers). Chicken is being slowly eaten in every other leftover kind of way. Thai basil and cilantro went into a Thai pesto sauce. Right into the freezer. Save it for when Mom wants noodles again. We agreed. It’s worth the drive to go find a good pho restaurant. We are making pho no more. And enough noodles. We want rice. Update: Oops, guess she isn’t tired of noodles. As I’m cleaning the dinner dishes, out come a box of chow mien noodles. 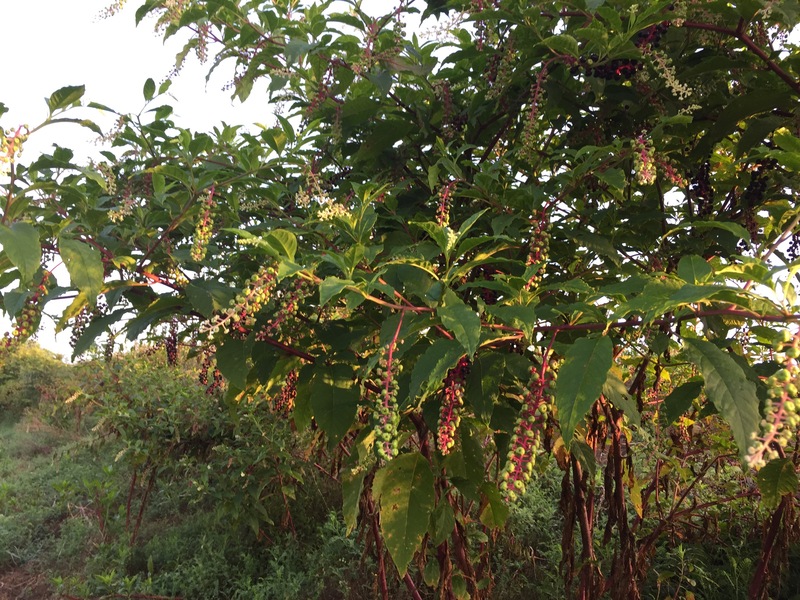 This entry was posted in Road Trip, Zigzagging and tagged cooking, pho, thai basil on August 19, 2015 by slantedstitches. Workshop on the River The Midsouth Knitting Guild created a low key set of classes last weekend, . Mosaic Sampler Hat taught by Lee Louise Slack. This must be the fastest way to create two color patterns. I finished a full size hat in one day. How to Personlize Your Color Choices taught by Edie Payton. I kind of knew what colors were best for me. Edie confirmed it. Oh oh…now I’m in trouble of falling into another deep rabbit hole. Any kind of dyeing has been on my bucket list. I happily played with acid dyes last month at SSK. 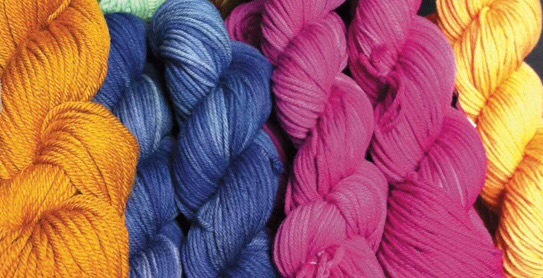 But I’ve been hesitant to start playing with natural dyes. I just assumed they were all yellows, oranges and browns. Or faded blues and orangey reds. When Melissa said the word, MAGENTA. I didn’t need to hear anything else. I was IN. I have plunged into the natural dye rabbit hole. What do you materials do you need help gathering? Poke weed…I should be able to find it. Fresh poke berries dye wool magenta. Fermented poke berries dye wool blue. So guess what I’ve been doing every morning? Day 1: gathered a cups worth and 7000 steps. Did you see me? I was that crazy lady in boots, hubby’s thick and big clothes and bucket, you saw driving to work. Yep, that was me. Out stomping around fields at the early morning light. My happy place. I left plenty of berries for the birds and next year’s seeds. Besides, I could only reach the low hanging fruit and saw no evidence of birds eating any. And a second larger crop will be ripe in a month. Hah! A degree in horticulture does come in handy once in a while and Google of course. I found a second larger patch. But ran out of elbow grease and freezer space. I’ve passed the location information to another dyer. There is plenty for everyone. I’ll be better prepared next year. Start back at kettle bell training to gain upper body strength. Make more room in the freezer. This entry was posted in Knitting, Zigzagging and tagged Color, dyeing, knitting, workshops on August 17, 2015 by slantedstitches. Got a Fitbit last week. Definitely motivation to walk more. Mom came with me to Memphis last week. Her first trip in several years. She apparently got a lot of rest because now we are on a mission. Making Vietnamese pho (a clear beef broth soup). When I said we could find the recipe online for chicken (fits in her diet restrictions). She got very excited It’s something she’s been craving for quite a while. Off to the market to find the ingredients. Have ordered bags to make in between cooking. And hunting for poke berries in the wild. More about that later. 7000 steps already this morning resulted in 1 measly cup of berries. 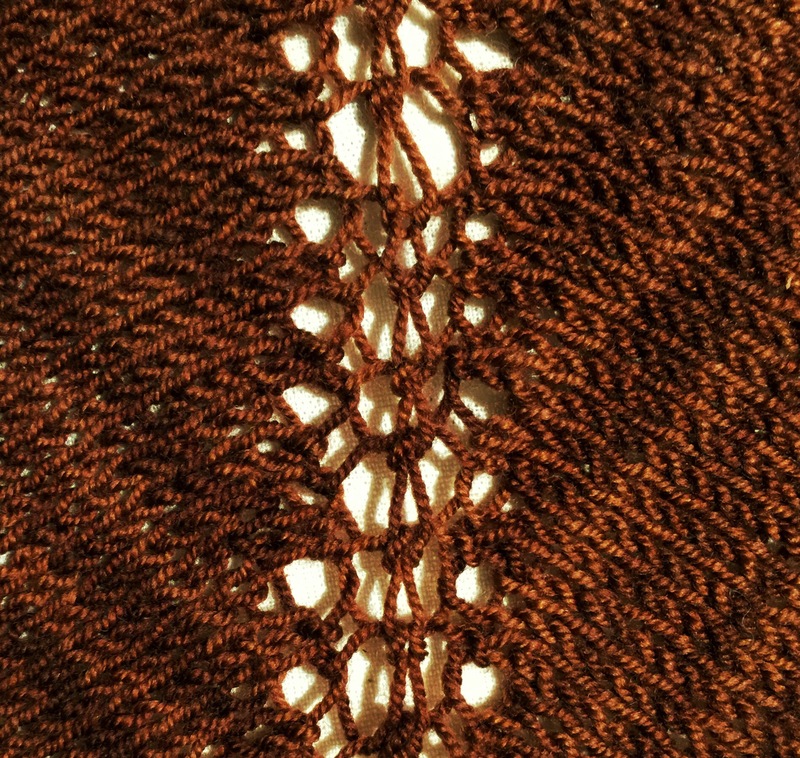 This entry was posted in Zigzagging on August 10, 2015 by slantedstitches. It works perfectly with this top! I was planning to overdye this silk scarf from Gale Evan’s Microwave Dyeing workshop at SSK. Too much yellow for my taste. 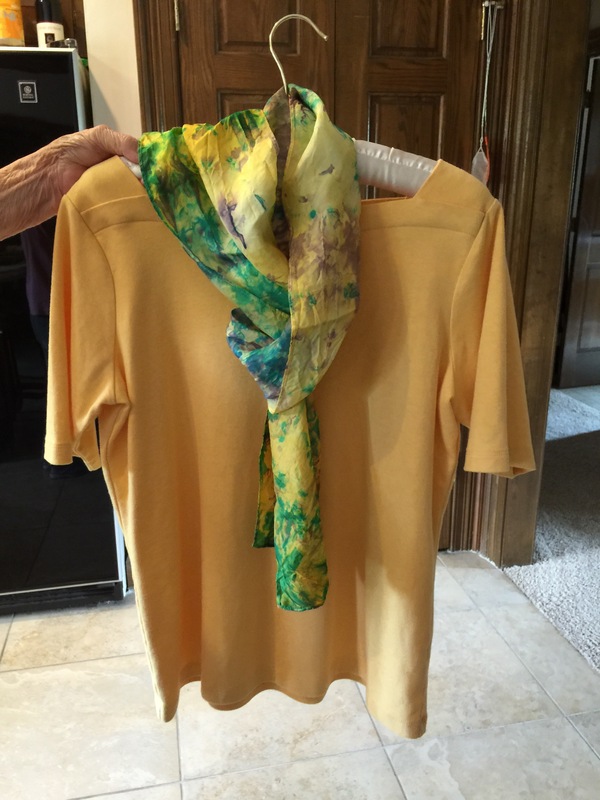 As I show off all my other dye projects from the workshops, Mom wanders off with that scarf. She comes back into the kitchen with a big Cheshire Cat grin on her face and my scarf draped around the neckline of her top. She wouldn’t let me take her picture. Just her hand. She doesn’t get excited about many things these days, so when she does…Mom gets whatever she wants. I’m not going to argue with a 92 year old. Would you? 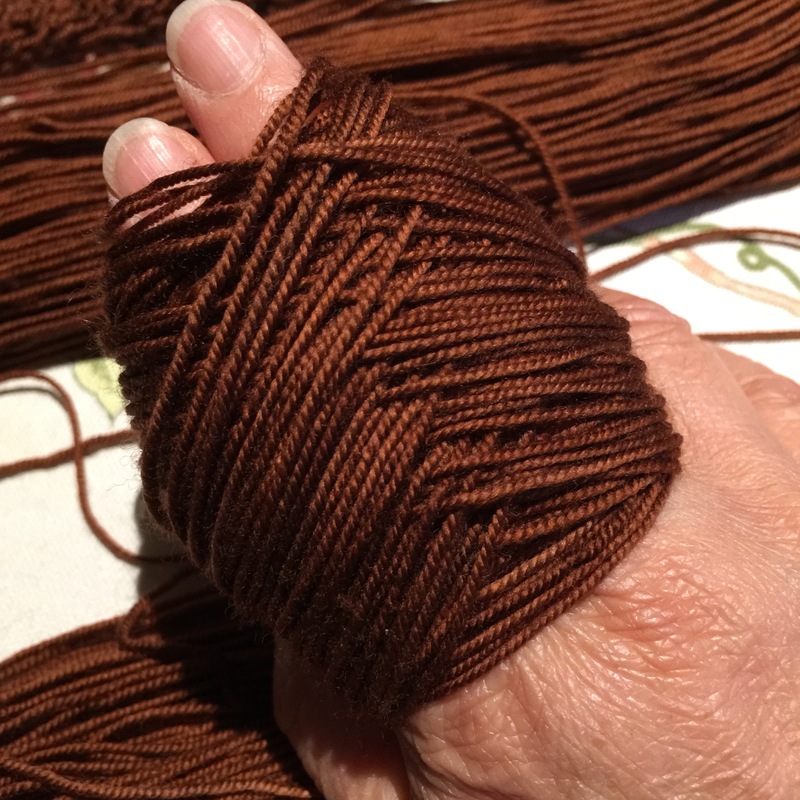 Besides, it means I get to play with dyes some more…. I wonder if she’s excited enough to play with me…..
Buy plenty of silk scarves for both of us to play. I wonder if we should do this before the Fall? Right now my sister, Mom & I are planning Dad’s memorial service in the fall. He past away last month from congestive heart failure and emphysema. He lived a very interesting life and a very long 93 years. Lived through the Great Depression as an immigrant’s eldest child of seven kids. Lost his mother as a teenager. 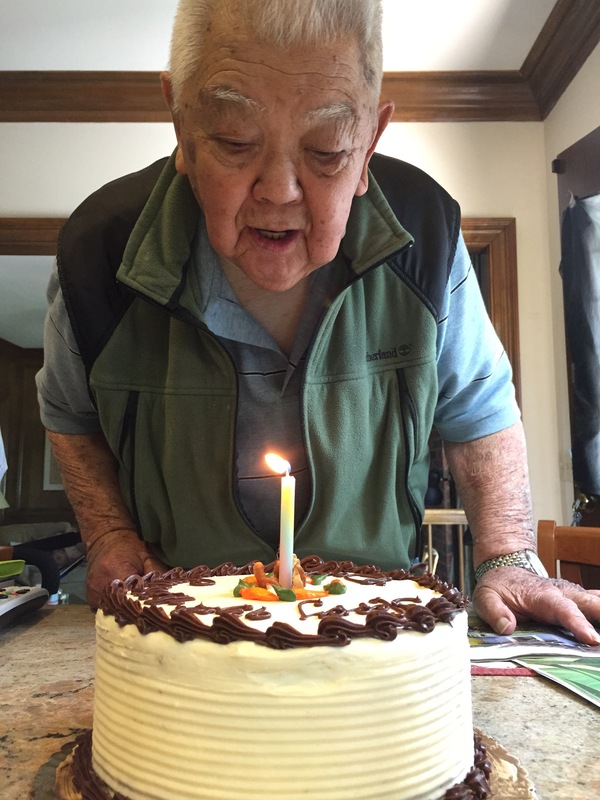 Was drafted into military service while in World War 2 American concentration camp for being of Japanese ancestry. How ironic is that? You are declared an enemy of the country your were born and raised, forced to leave your home in the West Coast, put into barb wired, guards with guns, concentration camps in the harshest places in the country but you are still conscripted into military service. He served as a parachuter and translator in the Army. He lived a quiet and successful middle class life in California. Active in several local organizations. He loved to fish, play golf, but most of all he loved to explore the backroads and foods of this country. He could find the best hole-in-the-wall restaurant anywhere. We were always on a mission every month to taste test the best fish, BBQ, hamburger, most authentic Mexican, Chinese, Russian, Italian, Greek, Japanese food and local specialty around. He had a wonderful sense of humor and charmed everyone he met right up to his last days in hospital. The nursing staff were very kind to tell us, that they looked forward to visiting with him on their rounds. They enjoyed his stories and jokes. Other patients who were angry at the world. He was at peace and died peacefully in his sleep. This entry was posted in Zigzagging and tagged dad, dye, dyeing, mom, parents, silk, wool on August 2, 2015 by slantedstitches.